The size of Tucker Prairie has been slightly reduced since the construction of I-70; the area is 145 acres. 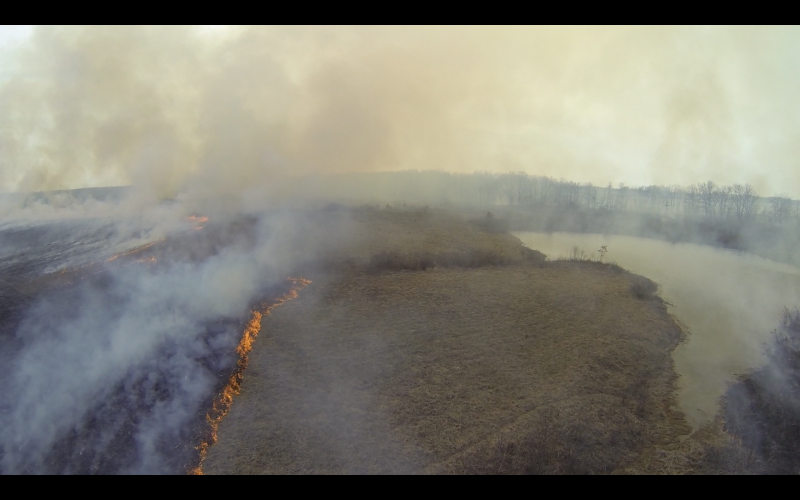 A fire burns over Tucker Prairie April 2, 2013. Various tracts are designated to be burned over a period of years in order to enrich the soil, speed up the decay process and prevent woody shrubs from taking over. A fire burns over Tucker Prairie April 2, 2013. The fire was one of a series of prescribed fires that day. 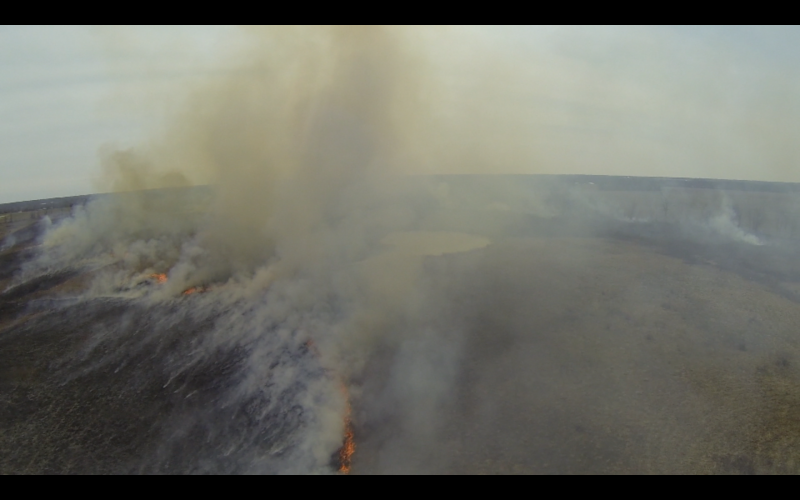 As a north wind rippled through the native grasses of Missouri’s Tucker Prairie on a sunny afternoon in April, the burn was about to begin. But this fire — which would turn dozens of acres of grassland into ash in hours — was nothing to fear. The 145-acre Tucker Prairie is one of the last remaining patches of unplowed native prairie in the state. And every year, the Missouri Department of Conservation chooses sections to burn. Fire beats back the woody species that threaten to overwhelm the grasses, and it helps release nutrients back into the soil. 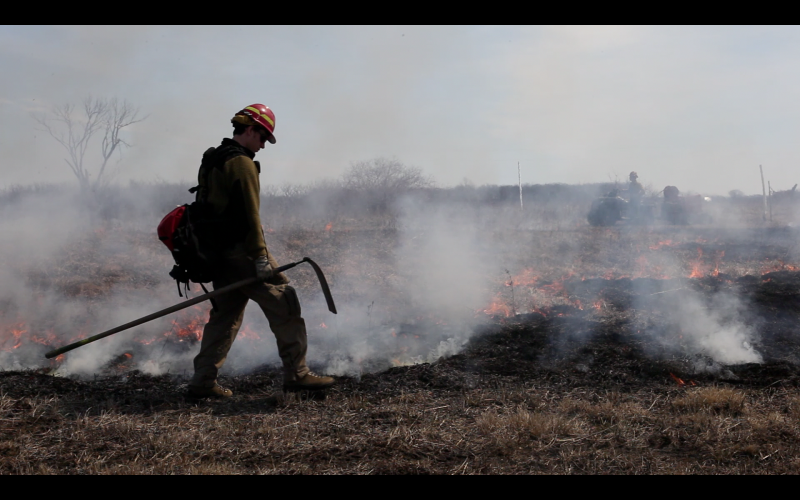 The burn crew had been waiting for more than a month for the right conditions to set the prairie on fire. And this day was the winner. In their bright yellow coats and hats and strapped radios across their chests, the eight members of the crew looked more like fire fighters than fire starters. Landry Jones, a wildlife biologist with the Department of Conservation, passed around burn maps and gave directions for how to proceed safely. Working in twos and threes, the crew would start burning the south side of the section, then move north along the perimeter. Lines of flames would progress from the edges inward and eventually meet each other in the center, closing like a zipper. 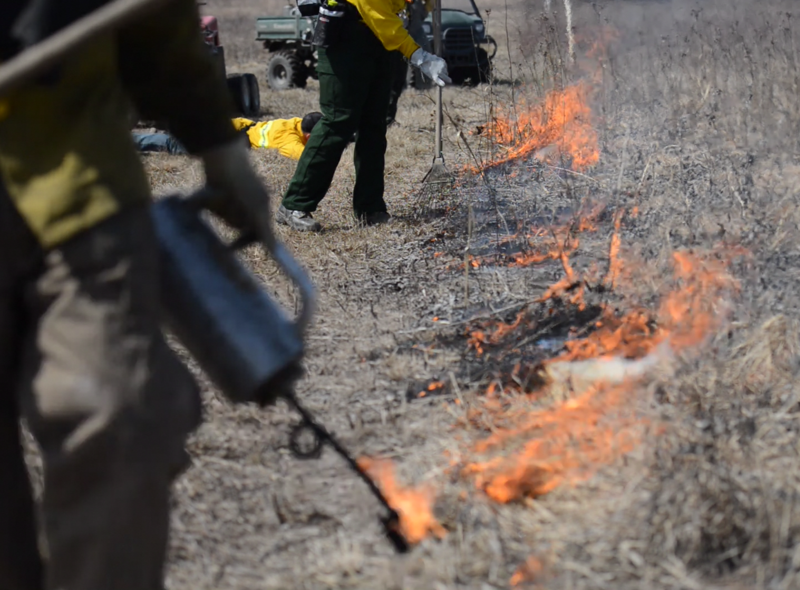 Fire like this spreads quickly through the grass but is walled in by fire lanes, which are mowed-down corridors that keep the fire from jumping to other parts of the prairie. The crew only burns when wind blows from the north so smoke doesn’t billow over the nearby interstate. John Faaborg, professor of biological sciences at the University of Missouri, watched as the crew prepared to work. Faaborg helps manage the prairie, which the university has owned since 1958. Tucker lies on a topographic border between plains that stretch north into Iowa and limestone hills that roll to the Missouri River, Faaborg said. This land could be forest or prairie, depending on whether it burns. Agriculture, development and invasive species have taken their toll on Missouri’s prairieland. Acreage has fallen from 15 million to less than 90,000, a decline of more than 99 percent. The story is the same throughout the Midwest. Once blanketing the middle of the continent from Canada to Texas, the prairies have mostly disappeared. Illinois, Indiana, Iowa, Oklahoma, Nebraska, North Dakota, South Dakota, Minnesota and Wisconsin have all seen about 99 percent of their native prairies destroyed. What remains of Missouri’s native prairies is a hodgepodge of isolated patches such as Tucker, which faces Interstate 70 on its north edge and private property on the south. Tucker Prairie may not be big, but it is certainly special. Because it has never been turned over for crops, Tucker is a valuable source of seed for restoring other prairies, like the Prairie Fork Conservation Area 15 miles to the east. “Tucker allows us to have an avenue for seed from species that were here thousands of years ago,” said Jeff Demand, a biologist with the conservation department who manages the Prairie Fork area. Preserving Tucker’s grassland ecosystem — keeping it a prairie, in other words — requires considerable human effort. And fire. A fire burns over Tucker Prairie April 2, 2013. 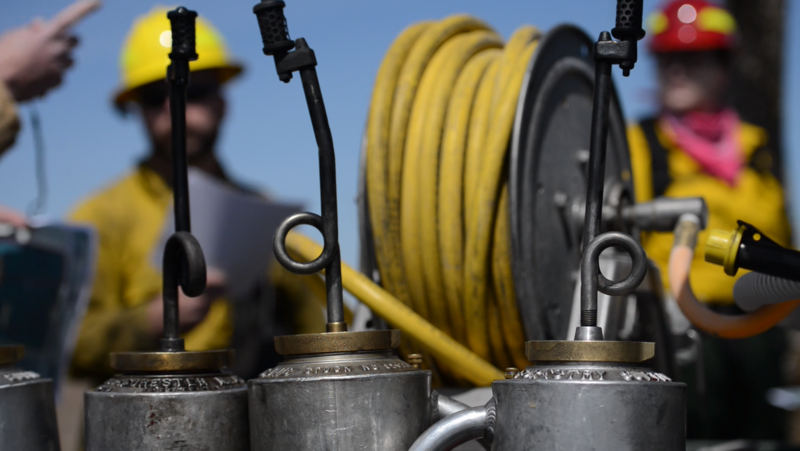 Fire restarts the prairie system. Regular blazes clear out trees, shrubbery and other biomass that otherwise might take over. Fire also nudges along new growth, enriches the soil, stimulates seed production and ultimately advances biodiversity. Faaborg and his colleagues aren’t the first people to light fires on Missouri’s prairies. Humans have spread fire — and with it, prairie — throughout the region for more than 10,000 years. Native Americans were the original curators of America’s prairies. Early people would burn for a wide variety of reasons: to promote the plants they wanted, to harvest game, as a weapon in conflicts with other groups or as a precaution against arson. They also used fire to control the migration of buffalo, or even to entrap prey in a wall of flames. Moving west to east, burning by humans becomes a more important variable in the presence or absence of historical prairies, he said. Places like central Missouri have enough moisture to become prairies or forests, and human actions were important variables in shaping the environment. The crew finished burning Tucker’s western third within a few hours. Smoke drifted from a few persistent blazing spots, but the field was mostly gray and black ash. The fire had revealed evidence of some of the animals that made the prairie home. The skeleton of a long-dead deer lay exposed, its bones cooked the color of burnt French fries. The sun glinted off the roasted belly of an unlucky snake caught in the blaze. But not everything under the ash was dead. Tiny green plants pushed out of the surprisingly cool, moist earth, unharmed and ready to grow through the spring and summer. “This will green up again in about a week,” Faaborg said. A version of this story first appeared on Harvest Public Media. Find out more about the Missouri Drone Journalism Program at its website. 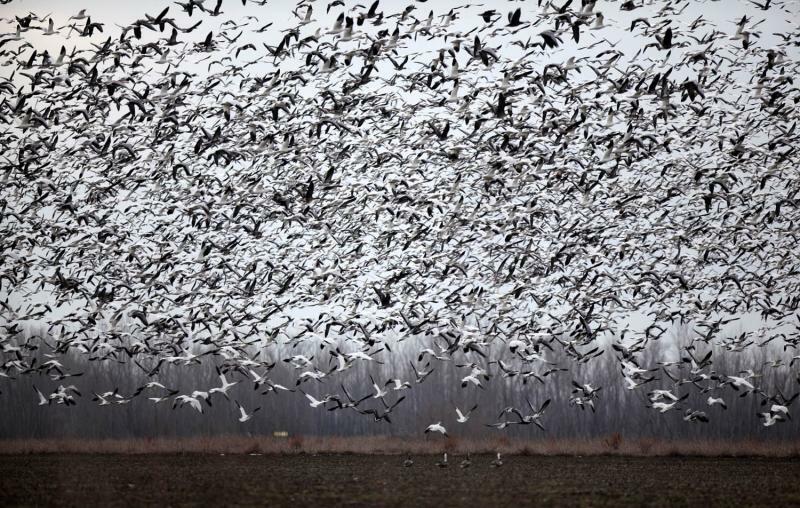 Why are there 50,000 snow geese in mid-Missouri? On Saturday as many as 50,000 snow geese congregated at Eagle Bluffs Conservation Area, a 4,400-acre wildlife refuge southwest of Columbia.